The All Star 2000, released in 1996, was a high-tech mid-high shoe designed to compete with Air Jordans. For 10-year-old boys in 1970, there was one word that struck an almost unnatural fear in their bony little chests: Buddies. “Buddies” was evil slang for ultra-cheap knockoffs of the classic Converse Chuck Taylor All Star canvas basketball shoes, which were the Holy Grail of sneakers. Everyone wanted chucks, and in several colors. But a lot of us got buddies, usually dredged up at the Dollar General Store for a couple of bucks. The canvas had all the give of a divorce lawyer, and the soles seemed to be stamped from hard plastic. Worse, there was no black rubber tag glued to the heel, with Taylor’s scrawled autograph below a white start. No tag, no chucks. Making the tag white instead of black has been the only significant change in the shoe’s history. Until now. Meet SuperChuck — the All Star 2000. Converse has taken the canvas Chuck Taylor and morphed it into a high-tech leather shoe designed to compete with the Air Jordans of the world. It looks familiar — the basic model is red, white, and blue with the famous ankle patch in full effect — but as the first new All Star in 79 years it’s definitely a different beast. The All Star 2000 hits the stores this week and will retail for $75, cheap by today’s standards. Jump on the bandwagon now, because the universities of Kentucky, Indiana, and Kansas will sport the shoe next season. Chucks always did look good with denim. Don’t worry, Converse isn’t dumping the canvas version. In fact, it’s enjoying one of its periodic surges in popularity thanks, in part, to the extraordinary number of alternative rockers who favor the shoe. And no one is getting rid of a design that’s sold more that 550 million pairs. Chuck Taylors are named after the Columbus, Indiana man who made the shoe famous through tireless promotion in the 1950’s. 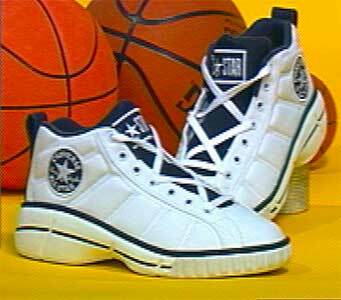 Thanks in large part to him, the All Star was the basketball shoe of choice for several decades. As scientifically enhanced leather kicks became all the rage, Chucks simply changed direction and became a necessary fashion accessory. The All Star 2000 will take some getting used to, but its striking combination of high- and low-tech is oddly appealing. But will it replace the original? Never. Editor’s Note: The All Star 2000 is no longer listed for sale in the Converse catalog. There are new versions of these high tech All Stars, called by names like Inspiration, Lore, React, and Legit, but none of these models has been for sale for longer than a couple of seasons. Meanwhile, the original canvas All Star Chuck Taylor continues to be Converse’s best selling shoe.